I will never forget the emotions – mostly disbelief and fear – that arose when I arrived at the cancer center. The word cancer literally stopped me in my tracks at the door. I had not yet been diagnosed, but the feeling was surreal. My life, with all its various roles, flashed before me: wife, mother of 5-year-old Tiare and 7-year-old Henry, nurse, volunteer firefighter, equestrienne––a life of so much goodness and fulfillment with so much yet to do. An abnormally elevated erythrocyte sedimentation rate (ESR) led to my arrival at the cancer center; otherwise I’m sure it would have been years before I was diagnosed with Waldenstrom’s macroglobulinemia as I had none of the symptoms commonly preceding this diagnosis. In 1994 my physician father-in-law ordered blood work for my husband and myself because he did not trust our vegetarian diet of twenty years’ standing. The only abnormality found then was my high ESR, which simply indicates the presence of inflammation. I was told that my ESR probably reflected a minor viral process and that I should repeat the test in a month. A year passed before I retested, and the result then was an even higher ESR. This time I followed up with subsequent testing through the emergency department where I work as a registered nurse and through my regular doctor. Finally I was referred to a hematologist-oncologist for further workup (little did I know that this would include the dreaded bone marrow biopsy!). 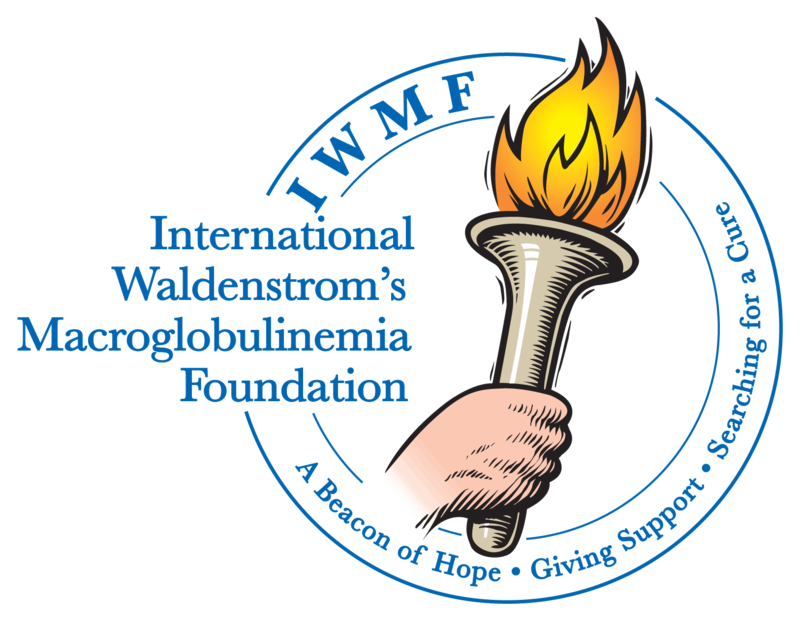 When the diagnosis came back as Waldenstrom’s macroglobulinemia, the treatment recommended was fludarabine. At that time a cautious period of watch and wait for an asymptomatic patient was not the recommended approach and Rituxan was not yet available. Current prognosis was 3 to 5 years. Intuitively I felt I should not turn to immediate chemotherapy since I felt fine and had no symptoms. I made an agreement with my oncologist: to remain under close observation and report any changes. One source of encouragement was my Australian shepherd, Belle, who had a type of autoimmune hemolytic anemia and was miserable on prednisone. One day her eyes said “No more.” So we discontinued the drug and consulted a homeopathic nutritionist veterinarian. On his program Belle lived an additional and happy 2 1/2 years. The day Belle died we took a walk on the beach and found a crosspiece of bone washed up in the surf. It displayed a cross section of marrow, and I snatched it up as a gift from either Belle or the sea. This talisman assumed a place in my meditation room, representing a healthy bone marrow (“the garden” as Dr. Gertz would describe it). To my regular activities of meditation, exercise, good nutrition, acupuncture, and horseback riding this imagery practice was also added. All was well until the 2003 IWMF Educational Forum in Reston, Virginia. Neurologist Todd Levine was present to study WM patients with peripheral neuropathy. I volunteered for Dr. Levine’s blood work and nerve conduction studies and, when my conduction study was repeated, I sensed something was amiss. I opened my eyes to find the entire group of researchers standing around me. One said, “Well, we’re finished here, where is your wheelchair?” They had recorded no nerve conduction up my legs (to me, signifying that those numb toes I’d had for years actually meant something). Dr. Levine and his group all seemed surprised when I walked away on my own power. Following this experience at the Reston Ed Forum, it was clear that my watch and wait was over and that treatment was needed. At this turning point another “message from beyond” came while riding Maple, my Arabian mare. We were alone on the trail, and I said to her, “Maple, you can be my legs if I can’t walk one day.” She came to an abrupt halt and–– I’m not imagining this––somehow communicated that she would not be my wheelchair, that I needed to do whatever was necessary to preserve my mobility. My first treatment was Rituxan, 26 infusions over the next 5 years, mostly solo, plus a six-month course of dexamethasone and chlorambucil. The Rituxan was rough––fevers, rigors, aches, and low blood pressure ––and 24-hour stays in the hospital for slow infusions. With the passage of these 5 years Rituxan seemed at best to keep my IgM stable at around 1900 and red blood cell counts just below normal. In the meantime I saw several WM experts in consultation, including Dr. Steven Treon at the Dana-Farber Cancer Institute, Dr. Ranjana Advani at Stanford University, and Dr. Levine in private practice in Phoenix. By the spring of 2011 my test values were deteriorating month by month, and I was feeling the fatigue and “ill-being” associated with active WM. The recommendation from a second consult at Stanford didn’t seem right: “You’re working, you’re walking – no treatment needed now,” I was told. Shortly thereafter I attended the 2011 Ed Forum where bendamustine was all the talk. I took notes and more notes and questioned Dr. Stephanie Gregory regarding her reservations about this drug. A month later as I was doing dishes one evening I started to see a cloud of white moths and grabbed at them, while my husband claimed to see nothing. The next day at work in the ER I suddenly began to see spiders; this episode resulted in a same-day visit to a retinal specialist who confirmed sausaging and hemorrhaging of the retina. Within a week I began the first round of bendamustine. Four cycles reduced IgM from over 4000 to my “normal” range in the 1900’s. This therapy was repeated in 2012, and by 2013 more treatment was again indicated. I expected more bendamustine, but this time Michael Lutrell came to the rescue with a posting on IWMF-Talk regarding a clinical trial of ibrutinib at Stanford. Once again the stars lined up and I was selected as a participant. I’ve now been a year on ibrutinib and am still amazed that within the first few weeks of taking it my life changed dramatically. I was transformed from feeling like a wilted plant into an energized and extremely active whirlwind! In fact, my husband began to dread coming home to our five acres after work when he faced the piles of trimming and yard work debris that needed to be loaded onto the tractor–– all projects I’d not had the energy to tackle for years. We WMers usually introduce ourselves to one another stating date of diagnosis, treatments received, and IgM level, but that is not all there is to say about any one of us. Do not think that the last nineteen years have solely involved treatments and preoccupation with WM. The initial nine years were spent in watch and wait, then ongoing Rituxan treatments for five years, and finally the past five years of bendamustine and now ibrutinib. All the while my life has been filled with joy and has unfolded quite normally. When I was diagnosed, our children attended a Waldorf school that required much parental participation. Because of their very young ages they seemed to incorporate Waldenstrom’s as a fact of our lives. It was probably far more upsetting to them to hear fire department calls and ER stories recounted at the dinner table! We remained active as a family––visiting Hawaii nearly every year, camping, canoeing, canoe-camping, and my husband and I trail riding on the horses. I even had to stand by as husband and both kids became dirt bike racers. I’ve been able to attend many nurturing meditation retreats, one lasting seven weeks. The last few summers have included two weeks spent camping on an isolated and deserted Baja beach with my childhood friend, our families, and our dogs, carrying in all our food and water. During plasmaphoresis as recommended by Dr. Treon I elected to have a huge catheter placed in my chest so as to be able to actively trail ride. I continue nursing, the last 29 years spent in the emergency department of a regional trauma center. We’ve buried two horses and currently have four more. Two years ago I took a fall off the younger Arab and had a total hip replacement (thankfully before starting ibrutinib with its associated platelet problems). Even setting out for the most recent Ed Forum in May was an adventure, as we came by way of three weeks in Costa Rica and two in Puerto Rico before reaching Tampa for the conference. The road since diagnosis has truly been a journey. I wonder if I’d feel so rich in soul if I hadn’t travelled this route. It’s been both interesting and challenging, but ultimately very rewarding. Dr. Marek Bozdech has been a wonderful oncologist and partner in the process, so willing to confer with Dr. Treon and Dr. Advani. Being a patient myself has made me a much better nurse in the face of my own patients’ discomfort and pain. I’m thankful for the Tibetan Buddhist lamas whose message concerns suffering, impermanence, and compassion. They’ve shown me that suffering is experienced when resisting one’s their present situation or wishing it was different. Some say if you’re going to have cancer, a slow-growing lymphoma is the best diagnosis to receive. The silver lining in all this seems to be having the time and opportunity to reflect, to look at one’s life and decide what is really important. Through attending the last fifteen Ed Forums I’ve realized that we WMers are not alone as we walk this path. Together we travel from feeling bewilderment and disbelief toward knowledge and confidence, and hopefully we come to discover both numerous blessings and a profound sense of gratitude.